October 28, 2015 Robert A. Weigand, Ph.D.
We all love to say “I told you so,” but gloating is difficult when the news is this bad. Back in March 2015, I published an article entitled Deflation is the Main Reason the Fed Will Raise Rates Later Rather than Sooner. As the exhibits below will confirm, deflationary pressures persist, thus the Fed will most likely not be raising rates in December 2015, either. The mainstream media is high on hopium when it asserts that raising rates is the default decision for December. Unless there is a significant turnaround in the trends presented below, rates will remain at current levels until at least April 2016. The story is worse for physical commodities. 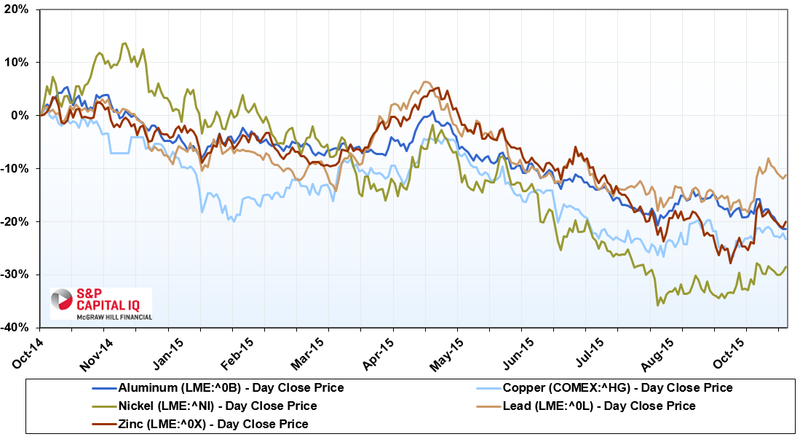 Aluminum, copper, nickel, zinc and lead have suffered price declines of -10% to -30% in the past year. 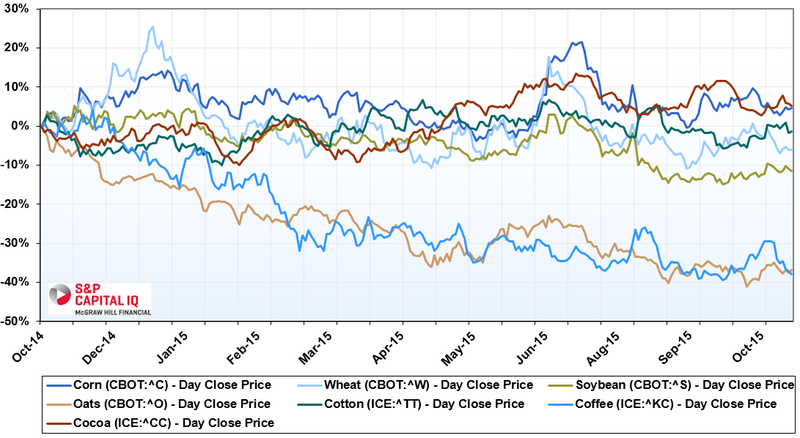 A one-year history of Bloomberg’s commodities index confirms the trend. The global economy has been experiencing widespread declines in the prices of both agricultural and physical commodities for several years. These trends are not consistent with global growth and prosperity. Every central bank in the world is easing its monetary policy except the U.S. Federal Reserve. The Bank of China has recently announced new monetary stimulus efforts on consecutive days. The Bank of Japan openly admits it has extended quantitative easing to include the outright purchases of equity securities (which is more of a monetary madness than a policy). The European Central Bank also laid out plans for another massive round of quantitative easing recently (although Mario Draghi is fast becoming known as the boy who cried “QE”). It is not plausible that the U.S. Fed will act against these trends. As reported by Bloomberg, Janet Yellen managed to obtain near unanimity (9-1, with only Lacker dissenting) from the FOMC to continue monitoring the situation and reconsider raising rates at its December meeting. One last exhibit below — the Baltic Dry Index (also from Bloomberg), a measure of global shipping activity, managed to show some improvement from June-August. But the index has trended down for the past 2 months, as the global market selloff quickly dampened business confidence. The world is not only a long way from “normalized” interest rates, we are a long way from the kind of robust business environment under which any central banker would seriously consider so much as starting the normalization process. Here is the question we should be asking: How weak can the domestic and global economy be if most major central banks are easing further, and a 0.25% increase in the Federal Funds rate is unthinkable?